I was excited. I had grand plans for an exceptional experience with my 9 month old. 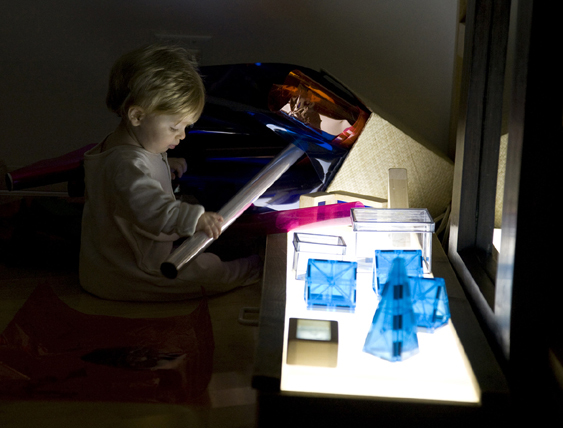 The light table was ready with things that were translucent, mouth-able, and able to manipulated by little hands. Despite being massively sleep deprived, I had gone up to my studio the night before and arranged these things in what I thought was an attractive way. Then the morning came. 4:45 AM and my rooster was calling. We ventured up the stairs – this was going to be great! 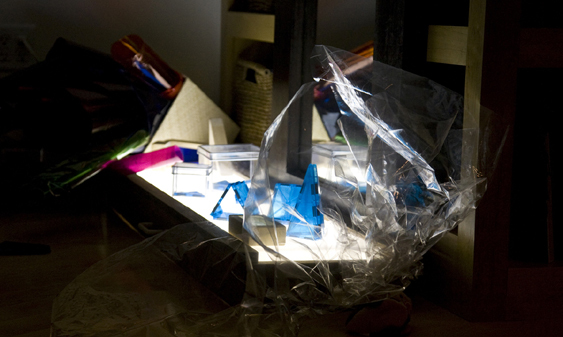 I put AC near the light table, and sat poised with my camera to capture all the various ways she was going to interact with the materials on the light table. She sat for a moment, then reached over to the basket beside the light table. No. Not good. That’s not what I planned. My mind went through a million thoughts in a mili second. Anything sharp in there? Why didn’t I think of moving that basket? Do I redirect her? Fortunately I kept my mouth shut, and quietly observed her actions. She became entranced with the clear cellophane paper. Twenty minutes later she crawled away, having had a magnificent time with the clear cellophane. The light table remained untouched.